Southwestern Black Cherry grows in canyons and bottomlands of the mountains of the Trans-Pecos in west Texas. It can be as tall as 30 feet, but is usually smaller than that. It grows in soils that are very alkaline and very acidic, so it is quite adaptable, although it has not done well when grown in the Dallas and San Antonio area. It does not perform well in the higher rainfall portions of Texas. 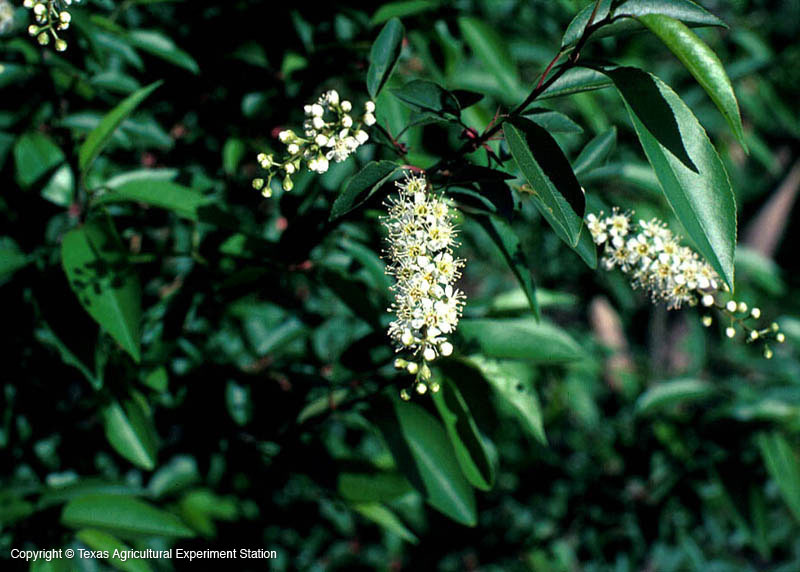 Long racemes of white flowers appear in early spring with the leaves, which are a lustrous green in summer, then turn yellow in the fall. Black cherry wood is valued in furniture and panel crafting and the tree and fruits are important for wildlife food and shelter. CAUTION: Wilted twigs and leaves contain high levels of prussic acid that can be fatal to humans and livestock if consumed.